If you own a business in Denver, Scottish Stained Glass can create a custom piece of glass to enhance the look and feel of your company. Our most popular commercial stained glass customers in Denver own hotels, bars, casinos, and retail locations. When visitors come to your hotel or casino, you want to impress them with the style of your facility. 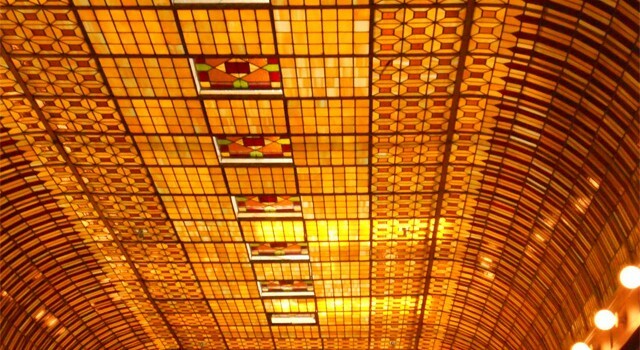 Some of our most impressive work has been in hotels like the Boulderado, where we created a beautiful stained glass ceiling that draws visitors in just to see it. We can create something completely unique to your business that will become a beautiful focal point. The options for one of our pieces in your business are endless. In hotels, you can add privacy to your rooms with etched and beveled windows, while still letting natural light into the room. Our glass work is like art, and since each piece is custom, we can always create something to fit into your current décor. Another great application for hotels is to add a focal point to a lobby area, where almost each customer passes through. This can become something that your building is known for, and something that actually brings business to you. Casinos lend themselves very easily to stained glass windows, signs, and doors. Because many casinos have a bright, colorful palate throughout the building, adding colored stained glass is particularly plausible here. You can create an upscale look by adding stained glass signs to designate certain areas in your casino, or doors to separate offices without upsetting the décor. If you own a bar or restaurant in Denver, consider adding a stained glass piece to incorporate a particular style, and distinguish your business from others. In bars, our Celtic style pieces and colored glass fit in beautifully. We can also design a custom sign with the name of your bar on it, something that will become a cherished piece in your company. To provide privacy between your customers in a restaurant, adding a beveled or leaded glass partition is a beautiful way to separate space. Also, if your restaurant sits on a pedestrian-filled street, you may want to add stained glass to your exterior windows to keep some privacy for those eating inside. Scottish Stained Glass Denver can accommodate any of your needs since each piece is completely custom. Our unique glass work can fit in with whatever you sell in your retail location, giving the area a high-end feel. Consider adding a piece behind your checkout counter; it will draw attention immediately to this area of the store. Another great application is to add stained glass to your dressing room doors. This adds a custom, beautiful style to an otherwise plain area, and still keeps the much needed privacy. No matter what your Denver business entails, Scottish Stained Glass can create the perfect addition to your commercial location. Contact us today to set up an on-site consultation, or just get answers to your questions!